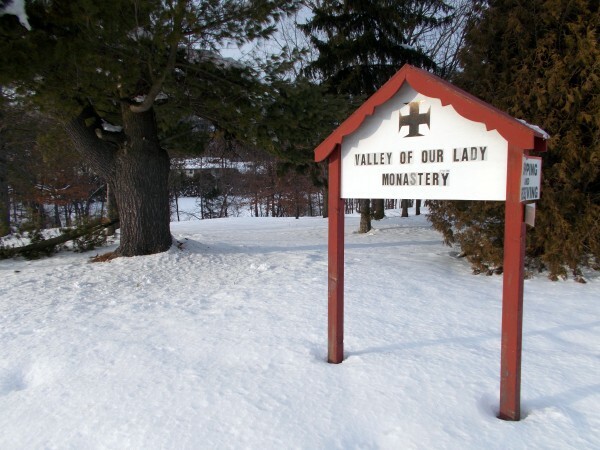 For today’s Feast of St Anthony of the Desert (aka St Anthony, Abbot or St Anthony the Great), and because the primary focus of this blog is how Madison is rejoicing in Jesus Christ, I wanted to show you a really wonderful religious community in our diocese: the nuns of Valley of Our Lady Cistercian Monastery in Prairie du Sac, near Sauk City. They are a cloistered monastery that rises way before the crack of dawn and chants the whole Liturgy of the Hours in Latin every day. They’re the only contemplative monastery in the diocese, and the only monastery of Cistercian nuns of the common observance in the country, and they’re praying for us night and day, even though most people don’t even know they’re there. As a branch of the Benedictine family, Cistercian spirituality is “ora et labora”, pray and work. Their primary, most important work is as official pray-ers of the Liturgy of the Hours, the opus Dei, the Prayer of the Church. Fittingly, they don’t just say this prayer but sing the Gregorian chant. The Church prays through their voices, and God listens and responds with grace for us all. Another essential form of prayer for them is Lectio Divina, meditative and contemplative reading. They also do manual labor in the form of various tasks around the monastery and also the work of making altar breads, which is how they support themselves. They practice silence, except for a daily time of social recreation. Some catechesis: under Church law, there are several different forms of consecrated life other than religious life. 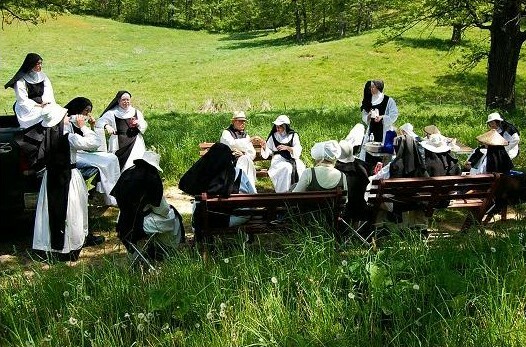 Within true religious life, women’s religious communities are of two different major types: active communities like the Sinsinawa Dominicans or the Dominicans of Mary, Mother of the Eucharist, who make simple perpetual vows and are called Sisters, and contemplative monastic communities who make solemn perpetual vows and are called nuns. A nun is the counterpart of a monk, a contemplative monastic who takes solemn vows. Sisters are often called nuns colloquially, but, for instance, the “Nuns on the Bus” are Sisters and not nuns. The Cistercians are nuns. The Cistercian nuns have an oblate group that Catholic lay people can join; I have met members of this and they are solid Catholics. Or maybe you are a young woman called to join as a nun? This is a healthy community with a traditional style of contemplative life. Some people who read this blog are interested in traditional liturgy. Various good local priests celebrate Mass for them, sometimes in English and sometimes in Latin. Occasionally that has been ad orientem (initially at the urging of one of the Society of Jesus Christ the Priests priests), but probably not usually. A priest tells me they do know the Traditional Latin Mass, which is a new development for them within the past year. The same priest seemed to think the intention is for the new monastery to have an “ad orientem” high altar but I do not know that for a fact. I was able to take some pictures recently of their buildings. The present monastery is actually seriously inadequate and unsuitable for the Sisters’ way of life, too small for the growing community, nothing like the style and plan of a Cistercian monastery, and I understand there is a problem of mold in the walls. 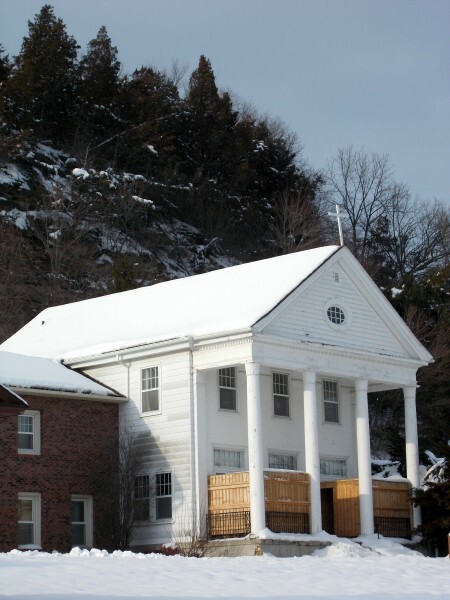 From the time of their founding in 1957 they have always intended to build a new monastery. But you want to see pictures of the nuns themselves don’t you? The best place to see pictures is on their website, which is full of lovely ones, together with a lot of edifying information on their way of life and their spirituality. 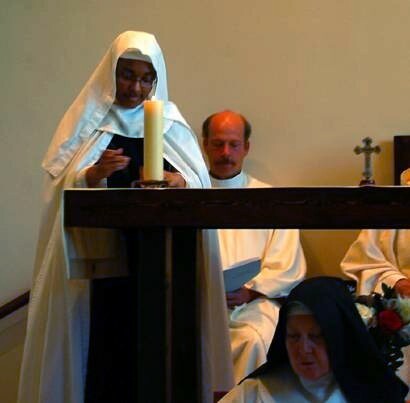 Below are some from the blog of the Mater Ecclesiae Fund for Vocations (a great group to donate to, to help people with student debt to enter religious life), of Sr Mary Regina and Sr Mary Benedicta professing their Solemn Vows (their final vows for life) in 2011. Although nothing is truly undignified, you get a glimpse of just how humble their chapel is, even though they have been there a long time it really has a makeshift quality, that must keep them looking forward in hope to a “real” monastery. The tabernacle is on a wood shelf mounted on the wall with metal brackets. Sr Mary Benedicta signs her vows. 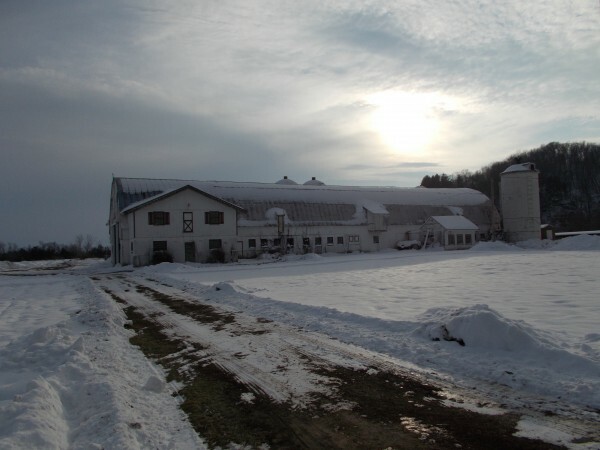 And, pictures borrowed from a flash slideshow on the new monastery website, here they are on the southern Wisconsin property their new monastery will be built on. 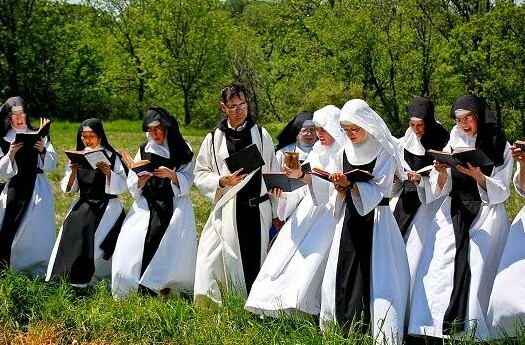 These amazingly beautiful series of images (please visit their site to see more of them) could have been from a century or two ago, but they are in fact from a May 15, 2012 Rogation Day Blessing of the fields on the Feast of St Isidore the Farmer. 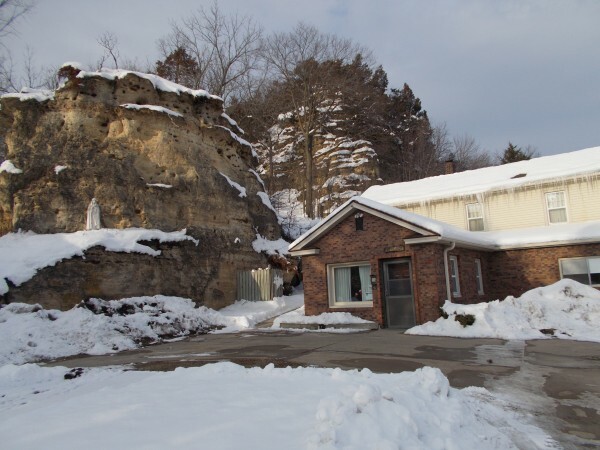 The Cistercian monk in the picture, Fr Robert Keffer, remained as their chaplain for around a year after the sad 2011 dissolution of his monastery, the nearby Cistercian Abbey of Our Lady of Spring Bank in Sparta, WI. They ran the printer supply business, LaserMonks, which thrived for a while and then went under, taking the monastery with it. 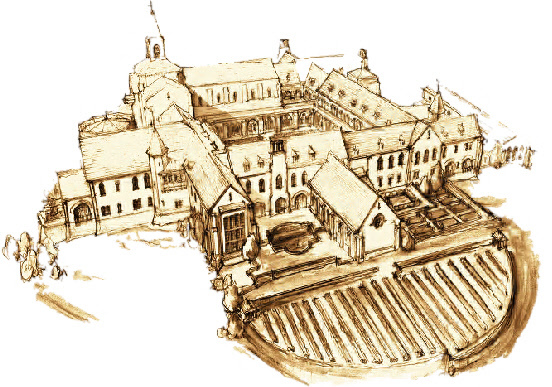 Below, a drawing of the new monastery plan. There is much more information and a great chronicle of the progress of the project, at the website dedicated to the amazing new gothic-style monastery, which will be the first of its kind in America. They’re really doing it right. At the monastery, there is a paper architectural model of the new monastery under glass in the hallway leading to the chapel. 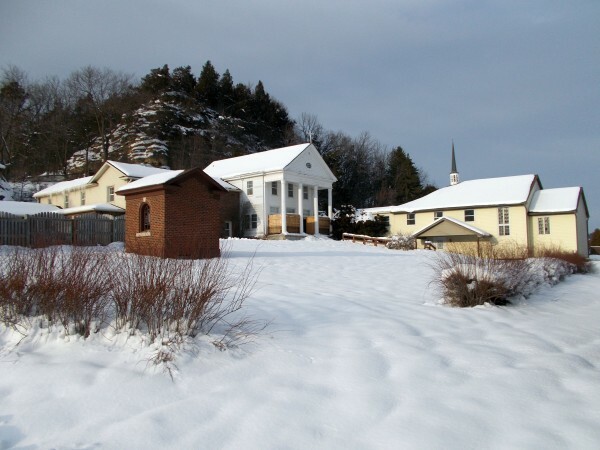 The first part to be built will be the guesthouse (yes there will be retreat accommodations at the new monastery–something they do not have now), which the Sisters would move into until the remainder of the monastery can be constructed. As you can imagine, they need the help of kind friends to make this possible. Please consider making a donation. Excellent job, Elizabeth! I was there once and poverty, humilty and devotion are so strong there. God bless them! Thank you for this beautiful entry on the Cistercian Nuns. Yes, they really do need a new monastery, so any help people can give them would be great! Sometimes people don’t donate toward a project like this because they think, “I can only donate $10 and they need millions!” I can assure you that the Sisters are grateful to EVERYONE for any size donation. All the “little” donations are BIG in God’s eyes and add up in time. BTW, just a slight correction. Sisters in simple vows make PERPETUAL Vows as well. 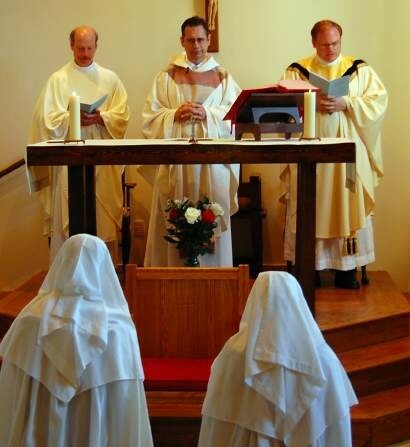 Monastic/contemplative communities usually make solemn vows which are, of course, perpetual. According to the 1983 code of canon law whether a community makes simple or solemn vows is determined by their constitutions. So, it’s determined by being cloistered or not cloistered. Thanks for your informative comment and correction, Sister! And an encouragement to us that our Cistercian nuns are really in need of our generosity. I donated! I notice that you are the Monastery of the Most Holy Rosary. 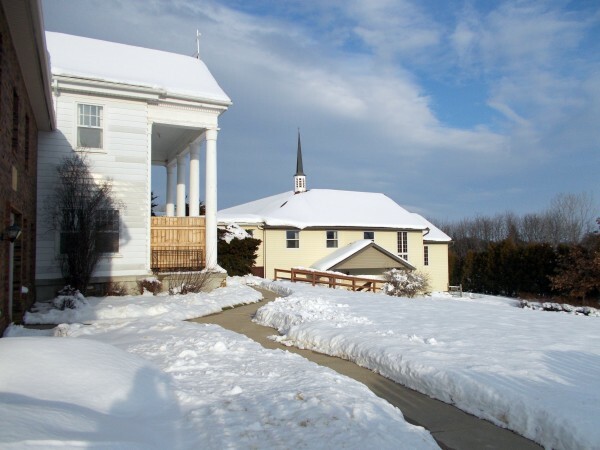 You must know our local, very different Sinsinawa Dominican Sisters are similarly beautifully titled, the “Congregation of the Most Holy Rosary”. Readers may want to know, these Dominican Nuns make the Seignadou Soaps. I have wanted to get some of those as a lovely Catholic gift that anyone would enjoy receiving. On February 28th. 1967, I arranged for a “Certificate of Agreement”, #1058 for Patricia Ann Troisi, my wife. Upon her death, which occurred on April 14, 2014 here in Williamsport, thirty Gregorian Masses were to be said for the repose of her soul. Is this program still in effect, and how do I access it. If you want, I can return to you the Certificate. Please advise where I should send it and to who’s attention.